Surface finishing is critical in the manufacturing of medical devices, especially for long-term implantable products where characteristics such as corrosion resistance and fatigue life are essential. At Memry we’ve mastered surface finishing through consideration of the interactions of upstream processes. The finishes that we develop are unique to each application and are optimized to fulfill our customer’s design requirements. 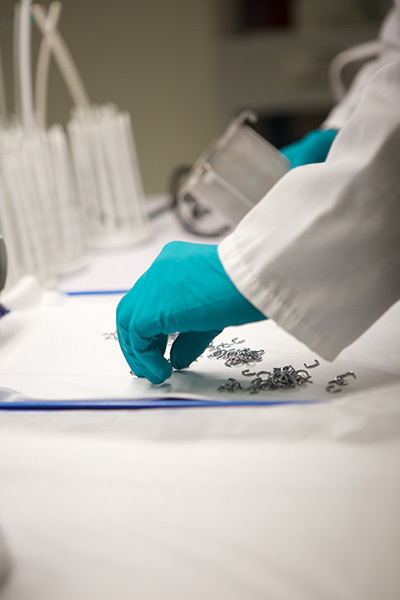 Memry offers many surface treatment processes for Nitinol components and assemblies. Micro-blasting employs a fine abrasive media, to create a matte textured surface. The process removes the recast layers and can also be used to improve adhesion of downstream over-molding or bonding. Mechanical polishing removes surface oxides or recast and can achieve finishes ranging from matte to lustrous. Tumbling is an effective means of deburring and producing a smooth, consistent finish on large batches of parts. Chemical etching uniformly removes surface oxides and base, including recast layers formed by heat intensive process, and is characterized by a satin appearance. Electro-polishing is used to polish and smooth the surface of the Nitinol component to maximize corrosion resistance, biocompatibility, and fatigue life. Passivation modifies the surface chemistry to create a titanium-rich oxide layer that is less reactive and more resistant to certain environmental factors.